I'm out of town tending to some personal business. Sorry if you were looking for me yesterday. I've only just got enough time to share with you our winner this week. the Mona Lisa taking a dump on a live chicken. Way to go Tgoette. 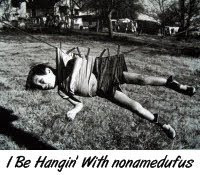 You be hangin' with nonamedufus this week! See everyone next Wednesday for our next Pause, Ponder and Pun. Congratulations!!! You're a real whiz at captioning. Congrats to the Mr. Tgoette! You deserve to HANG for that caption. Erm, I mean hang with Nomie, of course. After bad press over not showing emotion during his apology, Tiger Woods has again stepped foward. This time using no scripted material, he offered a waiting world what it wanted most: an unambiguous, heartfelt expression of the turmoil within. Me-Me: I should have known you not to be one to hold it in! Tgoette: Finally. I knew you'd take it soon. Congratulations. Quirks: Are you saying he's well hung? drinksbeforedinner: If you're commenting on the picture, that's a good one!